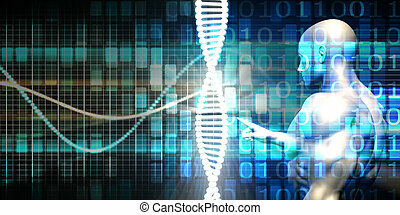 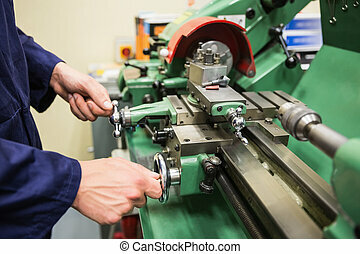 Adult education - engineering. 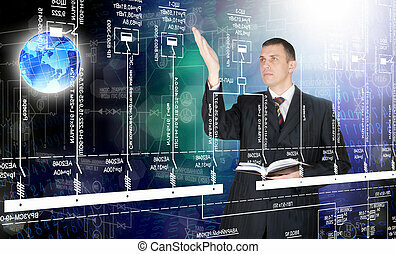 Electrical engineering student learns how to diagram a circuit. 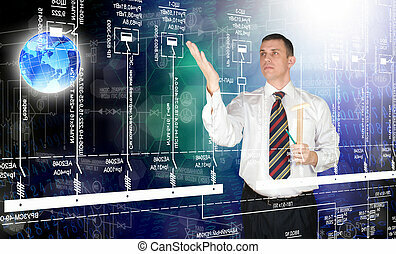 Electrical engineering student learns how to diagram a circuit. 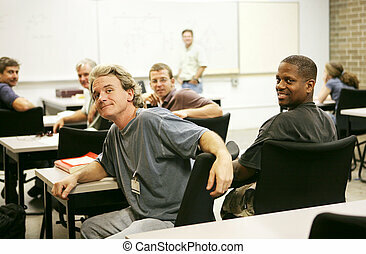 A diverse group of adult education students in class. 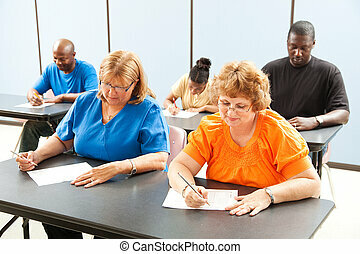 Classrom of adult education students taking a test in school . 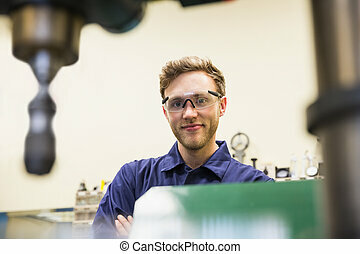 Focus on the guy in the front. 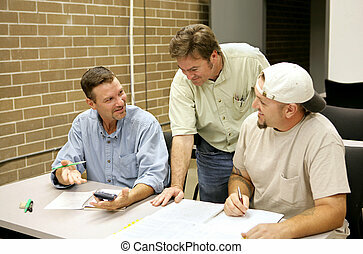 An adult education teacher and students solving a problem together. 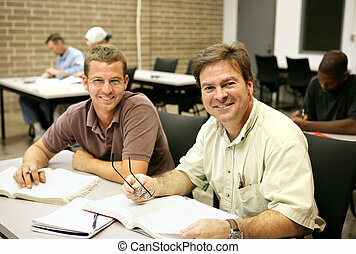 Friendly, happy adult education students sitting in class. 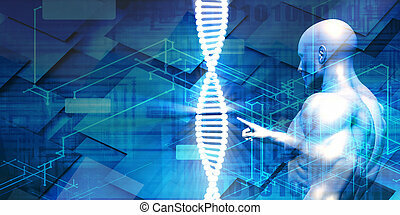 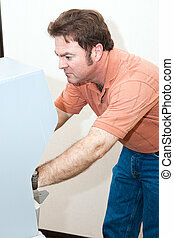 Mid adult man voting on a new touch screen machine. 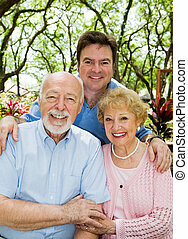 Adult son with his elderly parents outdoors in a natural setting. 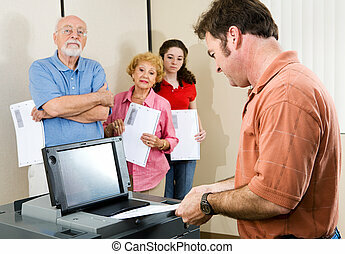 Mature adult man feeding his election ballot into optical scan voting machine. 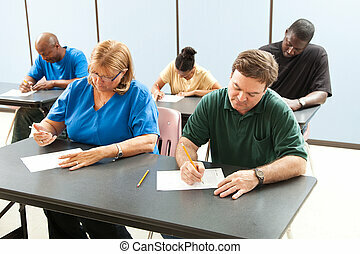 Diverse adult education students taking a test in class. 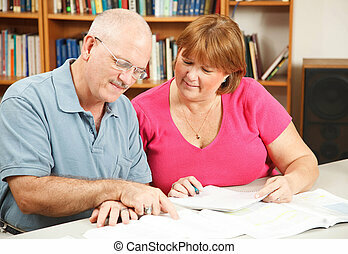 Mature woman in diverse adult education class. 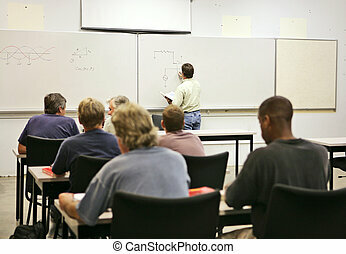 An adult education teacher in front of his class, drawing a diagram on the board. 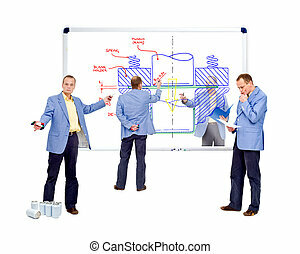 Focus on teacher and diagrams. 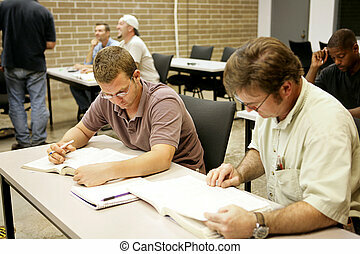 Diverse adult education or college class taking a test. 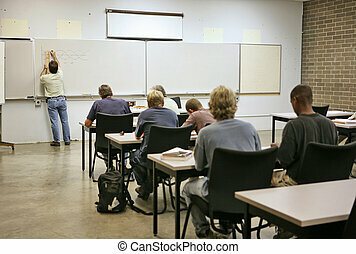 An adult education class in electricity with the teacher writing sin wave patterns on the board. 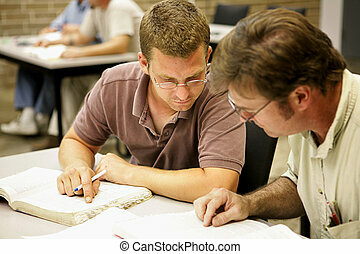 Focus on the teacher and what he\\\'s writing. 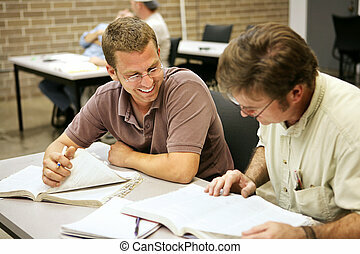 Adult students studying together in the library. 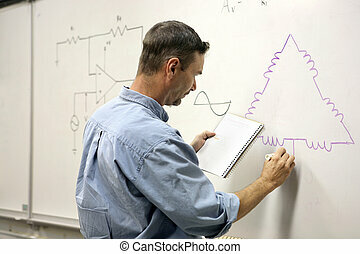 An adult education teacher drawing an electrical diagram on the board. 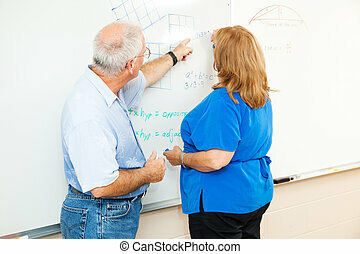 Adult education student working math equations on the board, with her teacher's help. 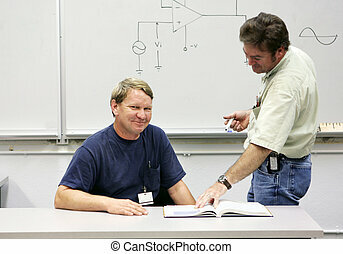 An adult education class in electricity. 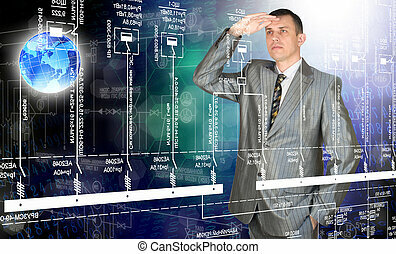 Focus on the electrical circuit diagram on the board. 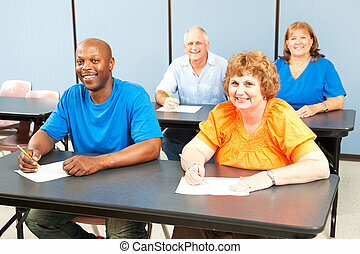 Happy, diverse group of adult education students in class. 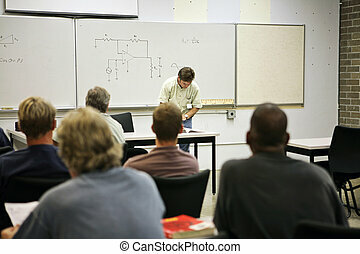 Diverse adult education or college class. 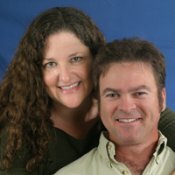 Wide angle banner. 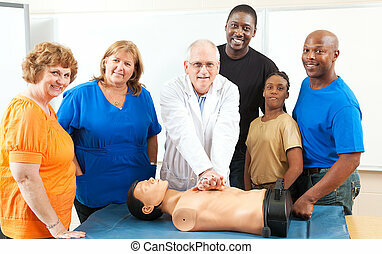 Adult education class learning CPR first aid from a doctor. 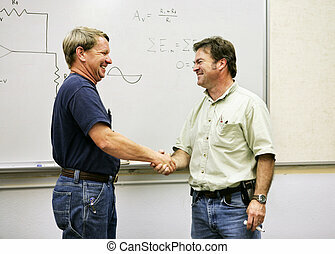 Diverse adult education class, various ages and ethnicities, smiling and happy. 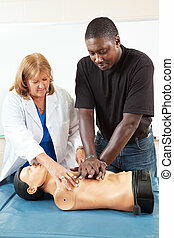 Doctor teaching Cardiopulmonary resuscitation to an adult african-american student. 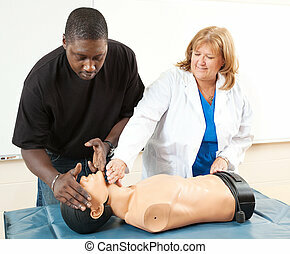 Doctor or nurse instructs an adult student in CPR life-saving techniques. 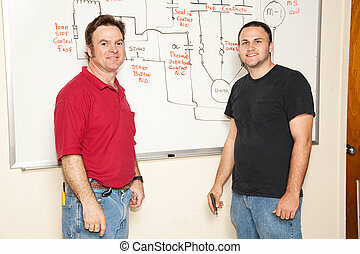 Electrical student and his teacher at the white board showing how to diagram an electric circuit. 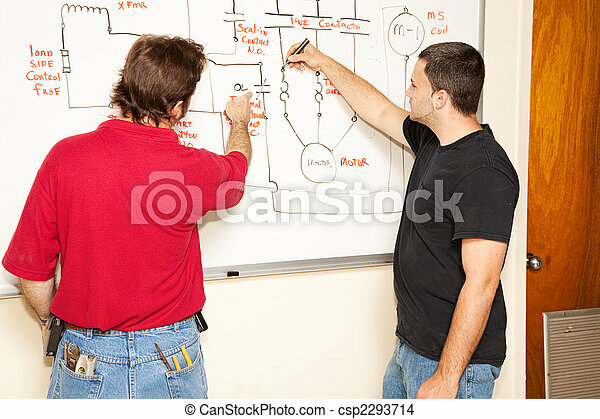 A construction foreman teaching a female apprentice how to read blueprints. 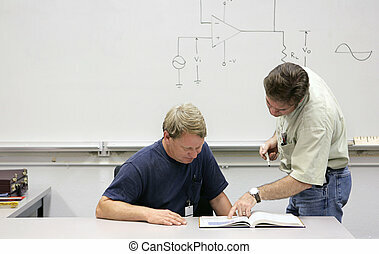 Electrical engineering student draws a diagram of a circuit on the white board while teacher looks on. 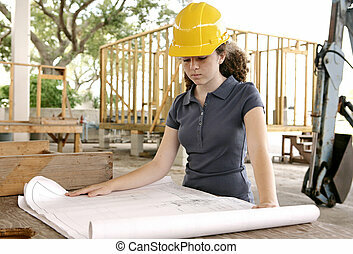 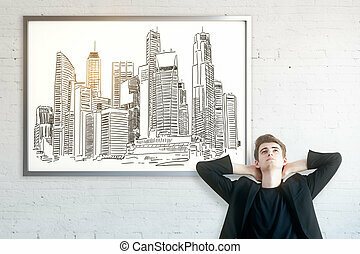 A female engineering student on the job site reviewing blueprints. 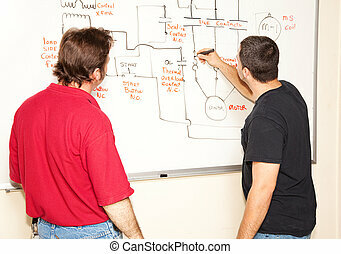 Engineering student and teacher going over electrical schematic on the board. 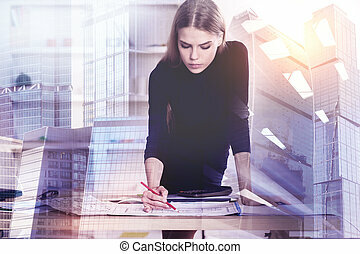 A young female engineering student examining blueprints on a construction site. 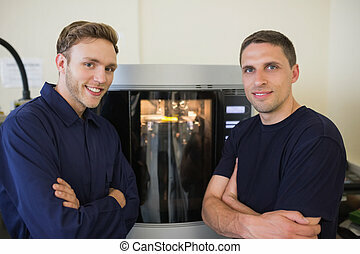 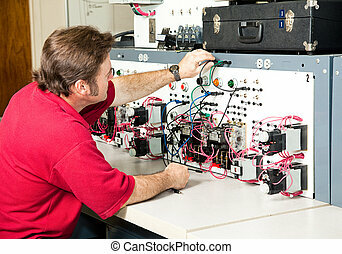 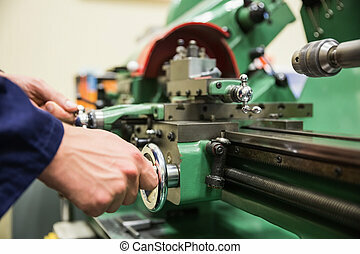 Teacher or adult student working on an industrial motor control panel trainer. 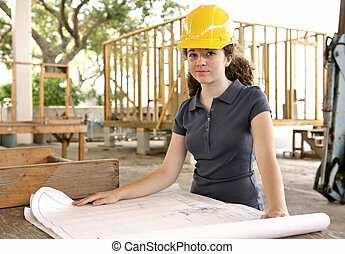 A female engineering student on a construction site marking blueprints as her instructor watches. 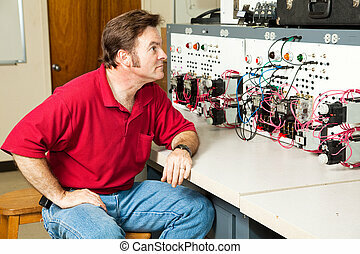 Electrical engineering teacher sitting at an industrial motor control center in his classroom. 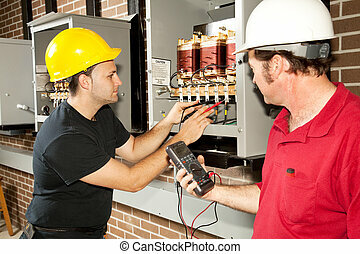 Electricians working on an industrial power distribution center. 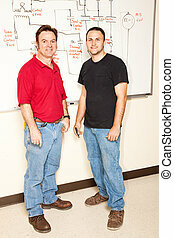 Actual electricians and authentic accurate content. 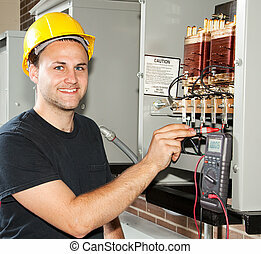 Young apprentice electrician measures power coming through coils of an industrial power distribution center. Engineer sitting at an electrical motor control panel. 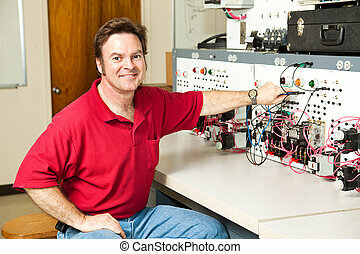 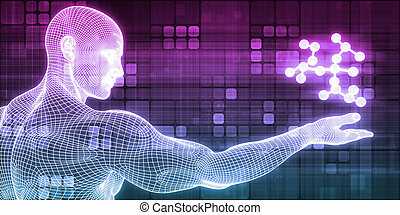 Electronics teacher sitting at electrical motor control center. 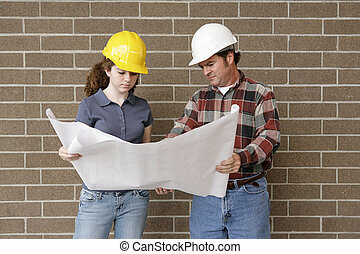 A construction foreman going over blueprints with a female apprentice.